This model has been built with the differential expressions of Houart's 1999 paper for various types of intracellular Ca2+ oscillations bassed on self-modulation of the Inositol 1,4,5-triphosphate signal. The parameter values for this model are different for different types of intracellular Ca2+ oscillations. The parameter values used for this particular model were taken from Figure 2 on page 513 and reproduces the corresponding curves. Parameter values from pages 515 and 520 may be changed to reflect curves for Bursting, Chaos, Quasiperiodicity and Birhythmicity. The initial conditions have been set after allowing the model to run for approximately 5 minutes until steady state. This file is known to run in COR and OpenCell. We investigate the various types of complex Ca2+ oscillations which can arise in a model based on the mechanism of Ca2+-induced Ca2+ release (CICR), that takes into account the Ca2+-stimulated degradation of inositol 1,4,5-trisphosphate (InsP3) by a 3-kinase. This model was previously proposed in the course of an investigation of plausible mechanisms capable of generating complex Ca2+ oscillations. Besides simple periodic behavior, this model for cytosolic Ca2+ oscillations in nonexcitable cells shows complex oscillatory phenomena like bursting or chaos. We show that the model also admits a coexistence between two stable regimes of sustained oscillations (birhythmicity). The occurrence of these various modes of oscillatory behavior is analysed by means of bifurcation diagrams. Complex oscillations are characterized by means of Poincare sections, power spectra and Lyapounov exponents. The results point to the role of self-modulation of the InsP3 signal by 3-kinase as a possible source for complex temporal patterns in Ca2+ signaling. 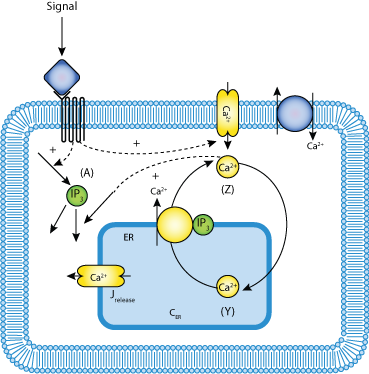 Schematic representation of the model based on the interplay between CICR and the Ca2+-stimulated degradation of InsP3. Besides simple periodic oscillations, this model can produce complex Ca2+ oscillations including bursting, chaos, quasiperiodic behavior, as well as birhythmicity. Derived from workspace Houart, Dupont and Goldbeter 1999 at changeset 72608d149029.